The Right Says It’s Fighting For Campus Free Speech. It Wants No Such Thing. The biggest First Amendment story of 2017 may well have been the battles over freedom of speech on college campuses. 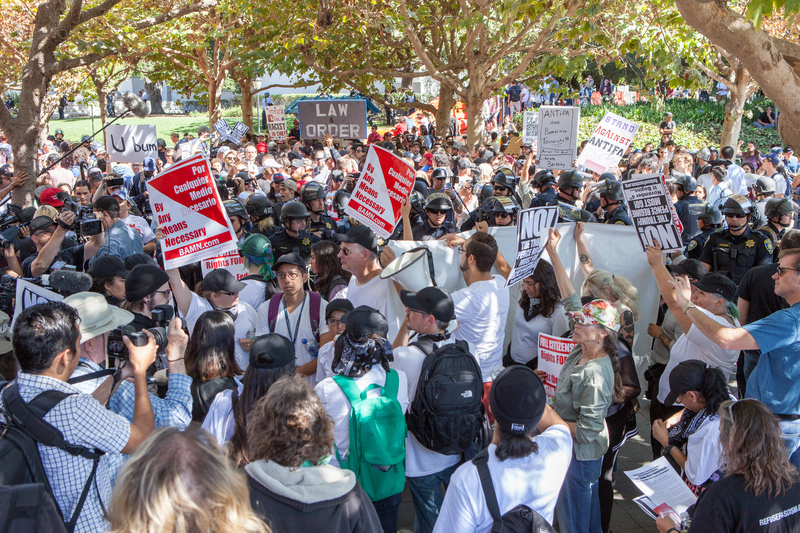 Fights over letting far-right luminaries such as Charles Murray, Milo Yiannopoulos, Ann Coulter and Richard Spencer speak at universities — or keeping them as far away from campuses as humanly possible — dominated much of the free-speech news of the year. It’s not a fight that’s had any champions. Too often, universities have permitted conservative speakers on campus, only to try to weasel out of commitments once the heat was turned up by critics. Student groups and others have tried to disrupt events through intimidation and other means. I’ve previously articulated my idea of a ‘cultural First Amendment’ — one that requires us to provide platforms for speakers regardless of their ideology and that shouldn’t simply be limited to freedom from state action. If we’re truly interested in free speech, we’ll respect it for each other regardless of the views expressed. That’s why I’ve argued that efforts to organize boycotts of Sean Hannity and Rush Limbaugh are just as ethically suspect as Donald Trump’s attacks on Colin Kaepernick for taking a knee during the playing of the national anthem at NFL games. But can lines be drawn — and how? Here, it’s quite helpful to read Joan W. Scott’s new essay in the Chronicle of Higher Education distinguishing between freedom of speech and academic freedom at colleges and universities. The Chronicle has a unmetered paywall, so I’ll do my best to report her argument here. The essence of the right’s assault on colleges and universities, Scott argues, has little to do with wanting to promote the free exchange of ideas. It has everything to do with demolishing the intellectual authority of higher education, which has stubbornly remained one of few cultural institutions the right has been unable to capture over the past half century. It’s been a cynical campaign in which right-wing speakers decry ‘leftist’ professors and administrations as the new purveyors of censorship and intolerance — with traditional masculinity, conservatism, Christianity and capitalism coming out on the short end. All the Murrays, Coulters, Yiannopouloses and Spencers of the world want is access to the campuses where, the right fantasizes, liberals and progressives brainwash the young. That’s why they frequently seek to speak at the Berkeleys, Ann Arbors, etc., that during the 1960s played critical roles in developing resistance to militarism and cultural hierarchy. In other words, if we take the mission of the university as being the education of students and the public, not just anyone should get the opportunity to speak. It shouldn’t matter whether the talk is happening in a classroom or a public event. That’s not to say that there shouldn’t be a First Amendment on campus or that conservative speakers shouldn’t be welcome. But any speaker — left, right or elsewhere — must have some credential beyond provocateur status. For Yiannopolous, Coulter and Spencer, all clearly are nothing more than button-pushers. They’ve authored no serious scholarship or journalistic work. They’ve held no teaching positions. Outside of their narrow ideological worlds, their views have no respect for content or rigor. They are, in fact, the shock jocks of the academic world. That may work in radio programming; it doesn’t in teaching. To his credit, Murray, who just retired from the American Enterprise Institute, isn’t merely a provocateur. He’s authored several works and is most well known for arguing a link between race and intelligence. But that work has been attacked and discredited by nearly all experts outside of conservative circles. “That may be why freedom is the principle invoked so forcefully on the right these days — freedom in the sense of the absence of any restraint. From this perspective, the bad boys can say anything they want, however vile and hateful. The worse the better, for it confirms their masculine prowess, their ability to subvert the presumed moralism of those they designate ‘eggheads’ and ‘snowflakes’ — female-identified prudes who, in a certain stereotypical rendering of mothers, wives, and girlfriends, are the killjoys who seek to rein in the aggressive, unfettered sexuality that is the mark of manly power. But there’s a reason that higher education is part of a liberal establishment — and that’s because a liberal consensus surrounding the abuses of power on the basis of gender, race and class is clear from the evidence that intellectuals have established for the past 100 years. Don’t scream your way onto the platform, conservative friends, shows us your evidence. Show us how we’re wrong. Previous Until Thursday, Trump’s War on Press Freedom Was Just Talk. Now It’s Real.